As part of my ongoing series on Chapter 11 bankruptcy processes and U.S. Bankruptcy Courts, I took the opportunity to visit the American Bankruptcy Institute's (ABI) Winter Leadership Conference to see if there was any change in the works. Looking historically at Bankruptcy in our judicial system, it seems we go through major changes about every forty years. The last time this was done was in 1978. For the past two years, the ABI has been conducting a series of Bankruptcy Commission hearings to study necessary reforms for Chapter 11 that are expected to be implemented by 2018. Sam Gerdano is the Executive Director of the ABI. He took a few moments out of his hectic schedule of running this conference to speak to me about the ABI and what the Commission is doing. (The full transcript of interview is provided below.) Gerdano explained, "The American Bankruptcy Institute is a 13,000 member professional association made up of individuals who are involved in the bankruptcy process, representing debtors or creditors in individual and corporate cases. They represent both sides of the issue, and so ABI is involved in continuing legal education. This conference is two days worth of programming about current developments in the law around the country in bankruptcy." 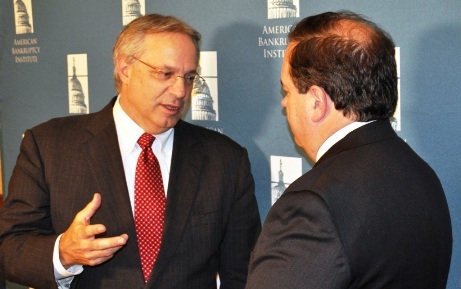 Gerdano discussed the purpose of the ABI Bankruptcy Commission hearings stating, "It's a two year process funded by the ABI. It's intended to comprehensively study Chapter 11, which is the basic corporate reorganization law in the United States, which is about forty years old. The law was passed by Congress in 1978, and most of its original architects, whom are actually on this Commission have identified that that's about the shelf life based on all the changes in the economy and economic structures that have evolved since then. So because of that, the idea is that it's really time for a fresh look, a reconsideration of the law's purposes and how they're still being met in the reality of today's modern Chapter 11." More information about the ABI Bankruptcy Commission can be found on its website including video links to Commission hearings. ABI Commission Co-Chair Bob Keach and Bob Price discuss purpose of the Commission. In Part 6, I will interview Commission Co-Chair, Bob Keach for more detail about the Commission and the hearing process and goals. Bob Price: Hi, I'm Bob Price, and I'm attending the Winter Leadership Conference here at the American Bankruptcy Institute in Tucson, Arizona and am with Sam Gerdano, who is the executive director of the ABI. Thank you for taking time to talk to us a little bit. I'd like you to educate our readers and viewers here about what the American Bankruptcy Institute is, what you do, and what's going on here with the conference today? Sam Gerdano: Well, welcome to Tucson and to the Winter Leadership Conference. The American Bankruptcy Institute is a 13,000 member professional association made up of individuals who are involved in the bankruptcy process, representing debtors or creditors in individual and corporate cases. They represent both sides of the issue, and so ABI is involved in continuing legal education, this conference is two days worth of programming about current developments in the law around the country in bankruptcy. We're also involved on a policy level with our bankruptcy commission to study the reform of Chapter 11. We're a Washington-based organization, so we've always had a policy orientation. We don't take advocacy positions in front of Congress. We don't lobby one side or the other because our members are very diverse. As I mentioned, we represent both creditors and debtors in business and consumer cases. Bob Price: I noticed a lot of diversity here. We're talking with judges, attorneys, and a member from the justice department was here today with the trustees, and it seems like you have quite a wide diversity of people here and interests going on. Sam Gerdano: Absolutely Bob, we're sort of the umbrella organization for every interest that's involved in the bankruptcy process. Bankruptcy, particularly in the corporate environment is really a kind of large negotiation of interests to try to maximize value in the case to produce the best outcome or recoveries to all the parties involved, and to have that, you've got to have all the representatives around the table at your events, and that's what the ABI membership is, very diverse. Bob Price: Now, today you had a commission hearing for the bankruptcy reform issue that's going on, and this is going to be continuing for a couple more years. Sam Gerdano: That's right, that's right. Yeah, it's a two year process funded by the ABI. It's intended to comprehensively study Chapter 11, which is the basic corporate reorganization law in the United States, which is about forty years old. The law was passed by Congress in 1978, and most of its original architects, whom are actually on this Commission have identified that that's about the shelf life based on all the changes in the economy and economic structures that have evolved since then. So because of that, the idea is that it's really time for a fresh look, a reconsideration of the law's purposes and how they're still being met in the reality of today's modern Chapter 11. So the Commission's work product, really at this point, is involved in outreach to try to involve as many people in the restructuring community as possible and get their views about how the current laws are working or not working and then to make suggestions for reform that can then be presented to Congress when the time comes. The hearing we held today looked very much like a Congressional field hearing with witnesses and a transcript and a record being established that can inform the reform process. Bob Price: I noticed today in listening to this Commission, and the one in San Diego that I attended last month, that there's a lot of back and forth between the panel and the witnesses. It's not like a preaching to the choir thing at all. There's some real debate going on here. Sam Gerdano: That's right. People have strong opinions about ways the law should be reformed, and so those impressions are being challenged by the commissioners so that at the end of the day, we have a rich discussion and a more informed process that we can then recommend in terms of recommendations to Congress. Bob Price: I've noticed a lot of changes going on just in the opinions of people as we're going through this process. A lot of debate, particularly around the issues today, of the representation of loan-secured creditors and things like that. It seems that it's a very spirited debate. Where can people who are interested, I've just started looking at this issue for some other reasons, but where can people who are interested in what's going on with the bankruptcy issues get more information? Sam Gerdano: Well, one place to start is the commission's website. It's commission.abi.org. There you'll find all the record of the public hearings that have been held to date. There have been six held around the country so far. All of the transcripts are available. All of the actually testimony, the live recorded testimony, is available. So you can get a sense of the dynamics of the debate that is just beginning, and it's a great way to inform yourself about current thinking about Chapter 11 today. Bob Price: And you don't have to attend the commissions to see it going on live. Sam Gerdano: Yeah, all of the hearings are streamed live over the Internet. We streamed live today here in Tucson. Again, there's a permanent record there, with a transcript that is available to the public. Bob Price: In addition to the people who are already in the legal profession, is there information available for law students and things like that as well? Sam Gerdano: Absolutely. Again, the process is designed to be as transparent as possible. So the commission site is open to everyone. It's not limited to ABI members. It's all publicly available. As are many of the materials on ABI's own website, abi.org. There you can find daily news about things happening in the bankruptcy world from major cases that you read about in the newspaper to other issues that affect individual debtors for example. And again, all of that is publicly available in our newsroom section, which is a very rich source of information about what's going on in current developments in bankruptcy. Bob Price: Well unfortunately, bankruptcy is a much bigger issue in this country right now than we wish it was, and hopefully things will change over the next few years to make it less so. 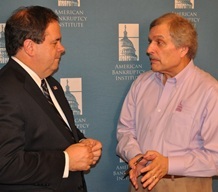 I appreciate the work you're doing with the ABI and looking for what's right and wrong in the current bankruptcy law and how to make it a better process for everybody. Sam Gerdano:Thank you very much for being here.